JACKSONVILLE, Fla. - Today turned out gorgeous! The skies cleared out last night making for a mostly sunny and chilly morning in the 40s. The sun warmed us gently through the cool 60s and into the mild mid to low 70s for the afternoon hours. Gusty westerly winds made for a breezy afternoon. Tonight we will turn chilly quickly under clear skies. The west winds should fade a tad to be between 7-12 mph. Temperatures will sink down into the mid to upper 40s. The moon should be spectacular, and will rise at 8:33p.m. Friday starts out in the chilly mid 40s under clear skies. Expect sunny skies and northwest winds between 7-12 mph. Temperatures will top out in the mild mid to low 70s. The weekend will be lovely! 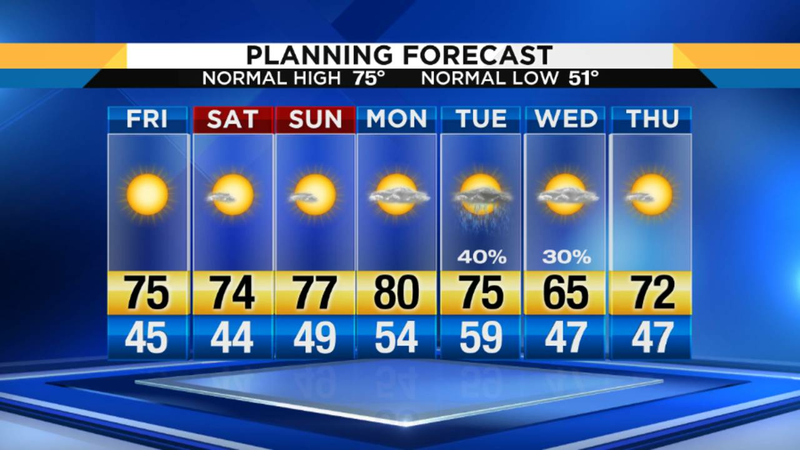 Expect cool mornings and mild, sunny afternoons. Saturday starts out around 50° with clear, sunny skies. Temperatures will warm into the mid to low 70s, with light winds out of the northeast between 5-10 mph. Saturday night turns cool with temperatures heading down to around 50° under clear skies. Sunday will be sunny with warming temperatures, topping out in the mid to upper 70s. Monday will be the warmest day this week, expect partly cloudy skies and afternoon highs in the upper 70s and low 80s. Tuesday a decent chance for showers is in the forecast, which will help with the pollen a bit. Expect temperatures in the upper 50s to start out with and in the mid 70s at their warmest. A 40% chance for scattered showers moves in ahead of a cold surge of air. Temperatures will be cooler Wednesday, only making it into the 60s with an isolated chance for showers followed by partly cloudy skies.